New Delhi, January 15: “India has a growing AI domain expertise in which the Indian Diaspora can expectedly perform well. Solar energy is also a rapidly growing sector for our growth and we will discuss these topics at the PBD Varanasi. The participants will be taken to Varanasi for PBD onto Kumbh Snan, and thereafter to national capital for participation in Republic Day parade on 26th of January as well,” said Ambassador Dnyaneshwar M. Mulay, Secretary (CPV & OIA), Ministry of External Affairs(MEA), Government of India, while addressing a power-packed gathering of intellectuals and thought leaders from India and some of the other countries in New Delhi on January 14, 2019. Opening the program, Pooran C.Pandey, Managing Project Director, DOC India (//doc-research.org/author/pooran-chandra-pandey/), a Berlin-based Global think tank and founding Chairman, DIMC said, “ We are now situated in a context where we as a nation would like to find concrete ways and means to leverage Indian diaspora for nation’s deployment of its soft power in a fast-changing geopolitical ecosystem. USA, UK and China did it well and we may have some lessons to learn from these countries while building on our specifics based on value systems and principles of equity, equilibrium and democratic principles”. “Our Diaspora, in terms of strength, is vibrant. Communication plays an important role. We don’t have many experts to talk about issues and matters related to Diaspora. Currently, many Indians who have done well abroad still do not feel comfortable. Slowly things are picking up, but still more can be done to be much more effective,” Secretary Mulay added. “Today evening is very significant that we are moving in the right direction. I’m really delighted to be part of this journey,” added Mulay while addressing the gathering. The panel discussion that followed subsequently was chaired by Ambassador Ashok Sajjanhar, Former Indian Ambassador to Sweden, Latvia and Kazakhstan, and saw the participation of esteemed panel members such as Professor (Dr.) Kamla Dutt, an Indian American and an accomplished author, Mohammad Haleem Khan, former Secretary, Disinvestment, Government of India, Ambassador Anup Mudgal, Former Indian High Commissioner to Mauritius and Colonel (Retired) Jaibans Singh, a reputed national affairs’ specialist, and an accomplished author. Professor Kamla Dutt on this occasion said, “India is respected for its non-aggressive and holistic approach to life by any country hosting Indians. This is a good quality of us which always puts we Indians in high credentials against any other another country. Our spiritual face is key to the world to live in peace and togetherness. We should stress on these as Indian Diaspora is more connected to roots on the social value systems and spirituality of India. Md. 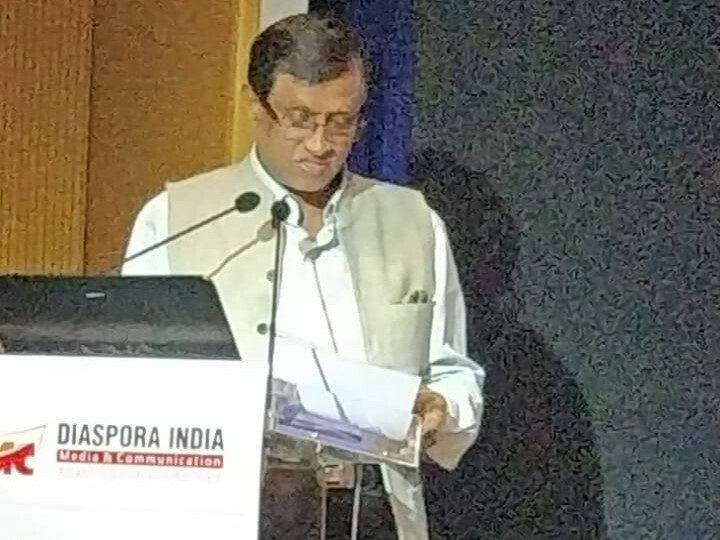 Haleem Khan, Former Secretary to the Government of India stressed on the need to bring few practical support system and benefits to the Indian Diaspora community so that they feel more connected to the country. One time engagement in a year is not sufficient. Former Secretary for Disinvestment, Government of India, Md. Khan stressed that the investment coming into India is because of the greater focus on interacting with the Indian Diaspora. He used the occasion of the DIMC dialogue to highlight the fact that India continues to be the world’s top recipient of remittances from its Diaspora, gathering close 79 billion dollars in 2017-18, as opposed to USD 3 billion in 1991. He said that it is a matter of pride and significance that FDI inflows into India can be expected to cross the USD 80 billion mark in fiscal 2018-19. Ambassador Ashok Sajjanhar presented a global view of the Diaspora community and appreciated their contributions especially from the Gulf region and African region. Ambassador Sajjanhar observed that significant pie of remittances is contributed by those who are working in the blue collar jobs and not by white collar jobs. India has to build a higher credibility, trust and focus on continued engagement for serious partnership with the developed regions’ Indian Diaspora, he said. “Prime Minister Midi has been able to energise and enthuse the Indian Diaspora in each of the countries he has visited. He has been greeted passionately. Who can forget that first-ever meeting with Indian Diaspora in New York’s Madison Square Garden? India’s overseas communities are growing increasingly prosperous and have emerged as a significant factor in the domestic politics of several countries, including the U.S., Canada, U.K., and others,” he added. Ambassador Sajjanhar, however, added a note of caution, in mentioning that a majority of these FDI remittances to India were coming in from the Gulf region and that there was a need for the government to look for ways to attract more investment from countries in the West, Europe and other nations where Indian diaspora continues to do well. He also said engagement with the Diaspora should not be limited to economics alone but should be broadened further to include other areas such as culture, sports, literature and the like. He particularly laid stress on engagement with Indian origin youth living abroad, and particularly the student community, which he opined constitutes a significant component of global Diaspora. Ambassador Mudgal maintained that the youth were futuristic symbols of energy, ambition, technology/skills, progress and adaptability to new ideas and values.He described the younger generation as an important human resource segment that had to be capitalised upon in meeting India’s developmental challenges. While recalling his many interactions with the Indian Diaspora during his diplomatic assignments in Mexico, Germany, Austria, Brussels, and the United States, he said he had always felt the need for the youth to be made full partners at every stage of policy formulation in the nation-building process. He said they deserve and have the right for equal participation. Recalling his time as India’s High Commissioner in Mauritius, Ambassador Mudgal said, “Girmitiya countries such as Mauritius must be considered for promoting investments. Indian businesses should be encouraged to explore investments in these countries for providing greater economic content to these special relationships. Engaging with the Diaspora, and the youth in particular, however, cannot be the sole preserve or responsibility of the government, but must necessarily also be collectively shared by wider society, he further added. Colonel Singh further opined that one reason behind the Diaspora reluctance to invest in India is their perception that Indians are not hardworking or honest enough to put their hard earned money in the country of their origin. So, they prefer to make large houses but won’t spend on business ventures. Secretary Mulay also launched the DIMC’s website www.diasporaindia.com, and said, “ communication through the digital medium can be a very effective tool today as Internet has brought people closer to each other in this era of globalisation,” he further added. He also acknowledged the importance of Indian Diaspora’s widespread presence around the world and its role in contributing to the development and growth of India. On this occasion, a film on the life and history of the Indian Diaspora in Mauritius, made by IGNOU, was also screened. Dr. Daljeet Sachdeva, Deputy Director, IGNOU, and director of this film, gave a brief introduction to the film. “DIMC would also undertake publishing of special reports, surveys, expert opinions on the Diaspora issues while building outreach pathways through films and documentaries on the achievements of the Indian Diaspora,” DIMC Chairman said. The program was attended by over 100 people drawn from various walks of life including the corporate sector, civil society organisations, academia, Indian diaspora from Kuwait, Surinam, Germany, and the US. Indian Mountaineer Satyarup Siddhanta Sets Guiness Record In Antarctica.